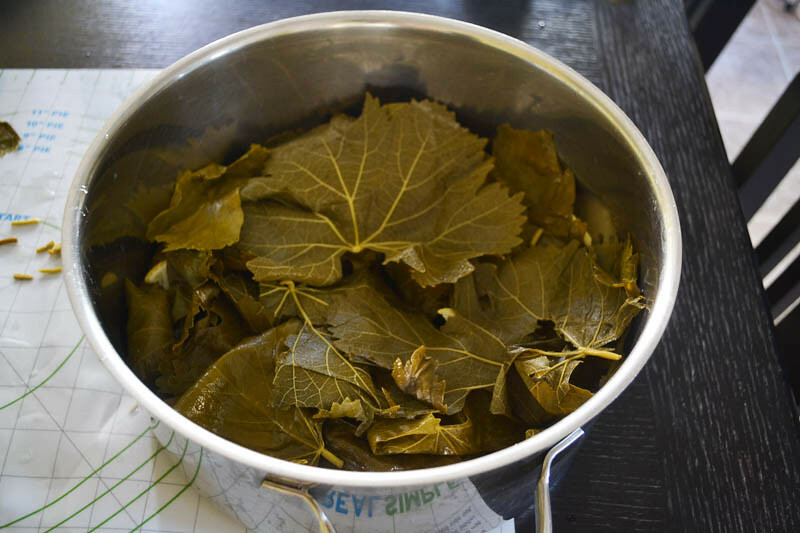 A step by step guide on making my mom’s Turkish stuffed grape leaves recipe. Simply filled with rice, ground beef and layered with fresh lemon. I grew up eating stuffed grape leaves. 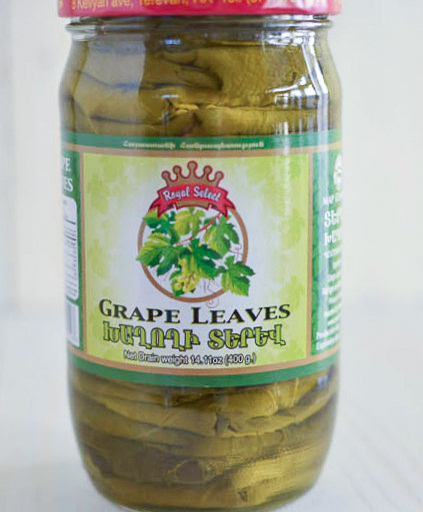 They are an acquired taste being that the grape leaves sit in brine and stuffed in jars. The brine soaks into the leaves and at the first turn of the jar you can smell the aroma of…brine. I don’t know how else to explain brine…vinegary with a slight tang, if that makes any sense. I remember mom making stuffed grape leaves when I was little and all through my upbringing. And this time, I was making them all by myself. We roll and roll the leaves and have an assembly line going, so this is a great project with a group of people! These stuffed grape leaves are different than the “other” ones you may find at Greek restaurants called dolma. However, no one makes them like my mom does and I have seen other places stuff their grape leaves with pine nuts and dill and I’ve even heard of including raisins, which sounds like an interesting twist. But I have to say, and call me bias, but Mom’s stuffed grape leaves are still my favorite. Yes you can! A bit more work, but not too much. 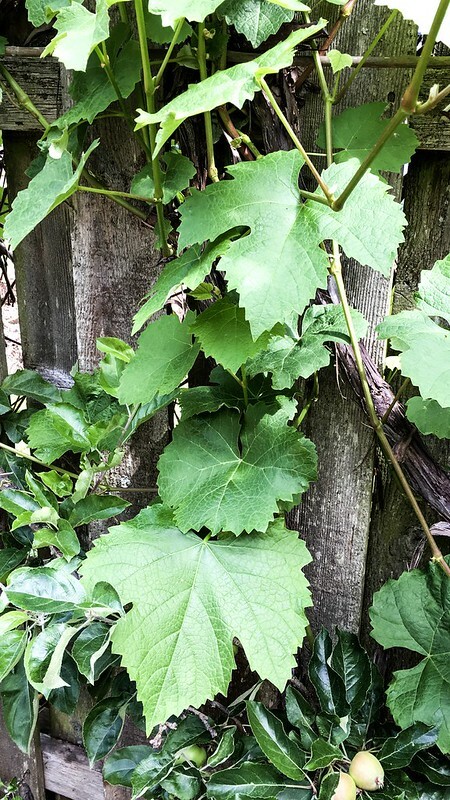 Snip fresh grape leaves off the vine and try and find medium sized ones, about the size of your palm. 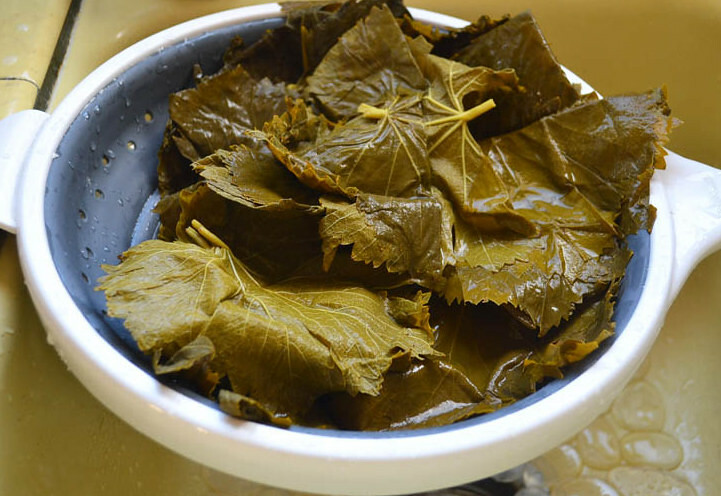 Wash well and then boil grape leaves in salted water for 2 minutes. Once done, “shock the grape leaves” by plaving the leaves in a bowl filled with ice water. You will notice the greens turn a bit darker, like the ones you jarred. From there, roll with your favorite mixture and continue how you would cook the rest of the recipe. My mom’s stuffed grape leaves recipe aka “yaprak” in Turkish is super simple and incredibly flavorful. 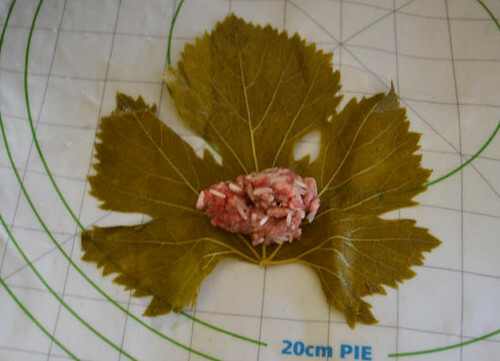 Ground beef and rice are the only 2 ingredients stuffed in those big briny leaves. The leaves are soaked and rinsed to help minimize that initial tangy flavor, yet it still offers its distinct briny note. 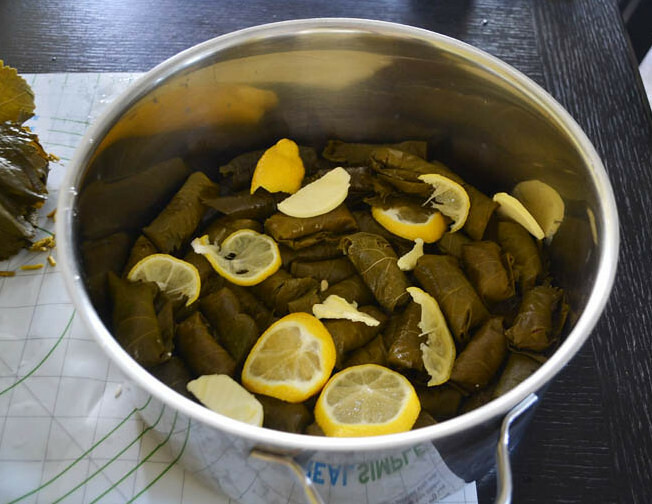 Slices of lemon and pats of butter (Ssshh..don’t tell anyone) are placed in the slow simmering pot with water and the residual liquid from the leaves creates a small pool of sauce, enough to soften the stuffed grape leaves perfectly as they gently cook. We love serving grape leaf rolls along side Turkish spinach and feta borek as part of a Mediterranean mezze spread or appetizer platter. For a lighter side, my kale tabbouleh with pomegranate and quinoa would be the perfect accompaniment with the bit of sweet and tartness from the pomegranate seeds. My homemade falafel recipe is served along side tahini yogurt, which would be fabulous for the stuffed grape leaves to dip into as well! 1) Remove packed grape leaves from the jar and gently pour into a colander. Unfold leaves, being careful not to tear and run cold water over them for a few minutes. Make sure all the leaves have been rinsed well. 2) In a large bowl, mix together the ground beef and rice. Season with salt and pepper. 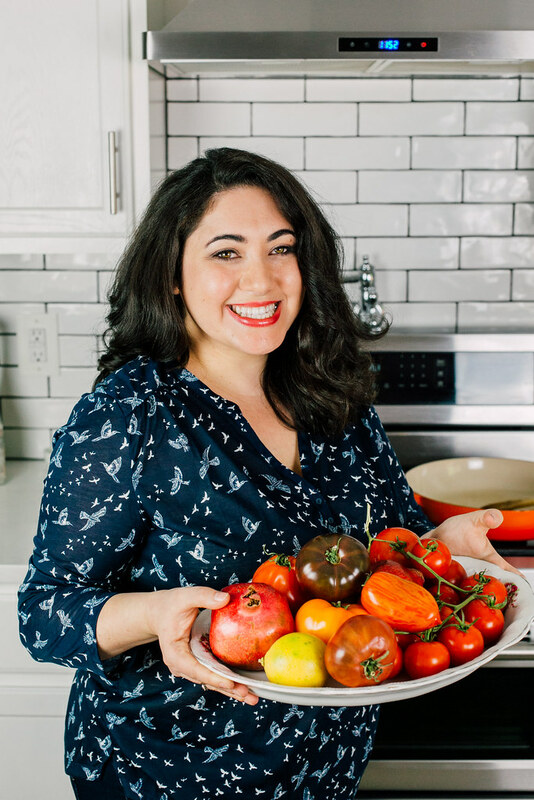 *You can test out a small meatball size in a frying pan to test the seasoning. 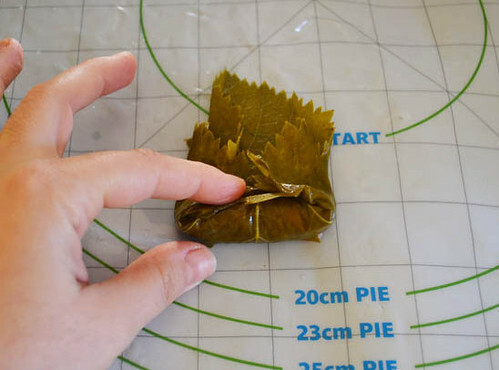 3) On a large work surface, set up an assembly line: Have a place to roll the leaf, the bowl with beef mixture and a large pot to place rolled leaves in. 4) On a flat, clean surface spread the leaf flat. There are 2 sides of the leaf. A “shiny” side and a “dull” side. Have the dull side facing you and the shine side down. Remove the stem with a small knife. 5) Place a small teaspoon size of meat mixture onto the bottom of the leaf. 6) Roll up half way and then tuck the sides in. Continue to roll until sealed. 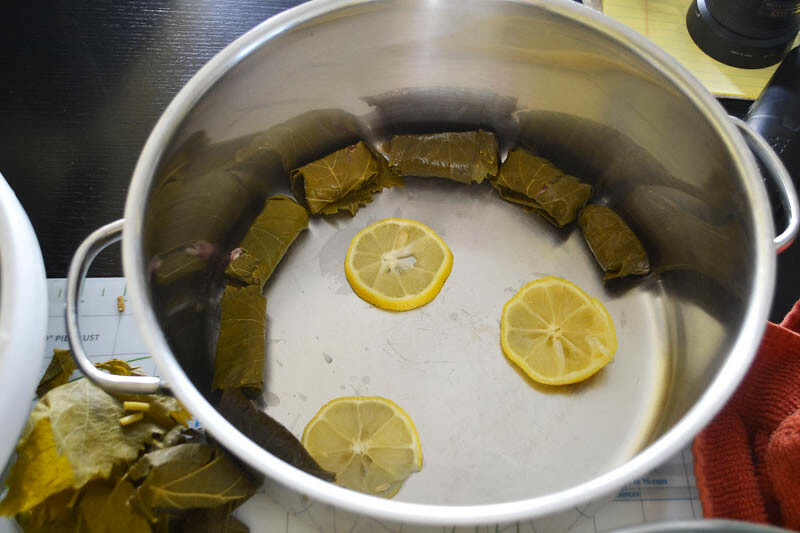 7) Place stuffed grape leaves, seam side down, on the bottom of the pot. 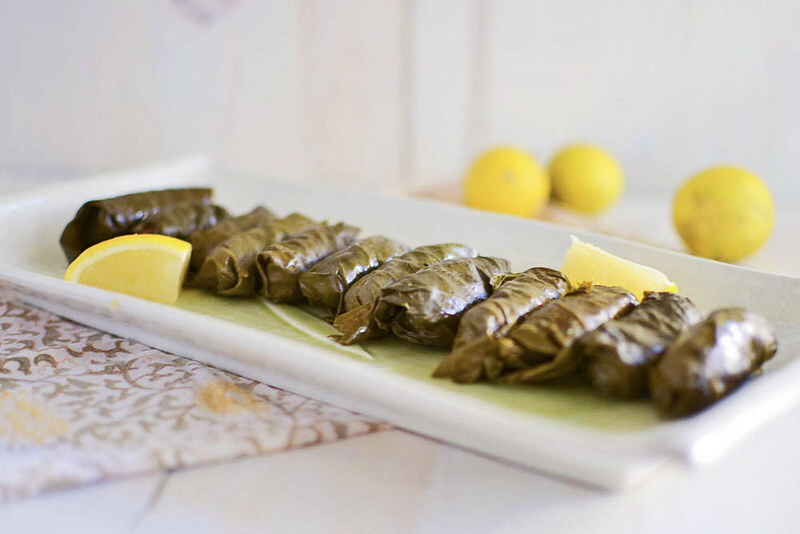 *Place lemon slices in between layers of stuffed grape leaves. 8) When all the leaves are stuffed, pour 1-2 cups of water in slowly and 2-3 Tb of butter. Any torn leaves can be placed on top to help steam. 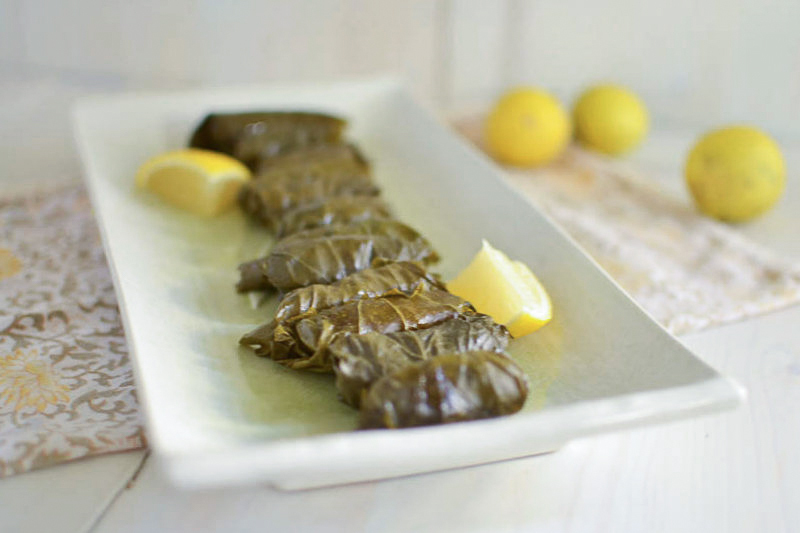 9) Cook the grape leaf rolls on low-medium heat for about 1 hour, until the leaves are tender and meat is cooked. There are so many versions of stuffed grape leaves recipe and I would love to hear yours! Do you stuff it with meat or keep it vegetarian? Do you eat your stuffed grape leaves cold or hot? 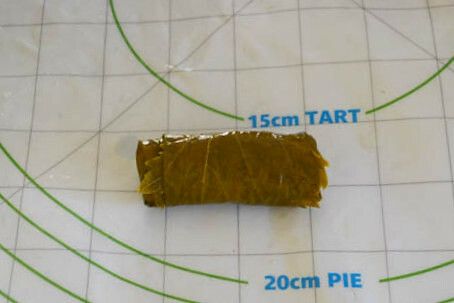 A step by step guide on making my mom's Turkish stuffed grape leaves recipe. Simply filled with rice, ground beef and layered with fresh lemon. Remove packed grape leaves from the jar and gently pour into a colander. Unfold leaves, being careful not to tear and run cold water over them for a few minutes. Make sure all the leaves have been rinsed well. In a large bowl, mix together the ground beef and rice. Season with salt and pepper. 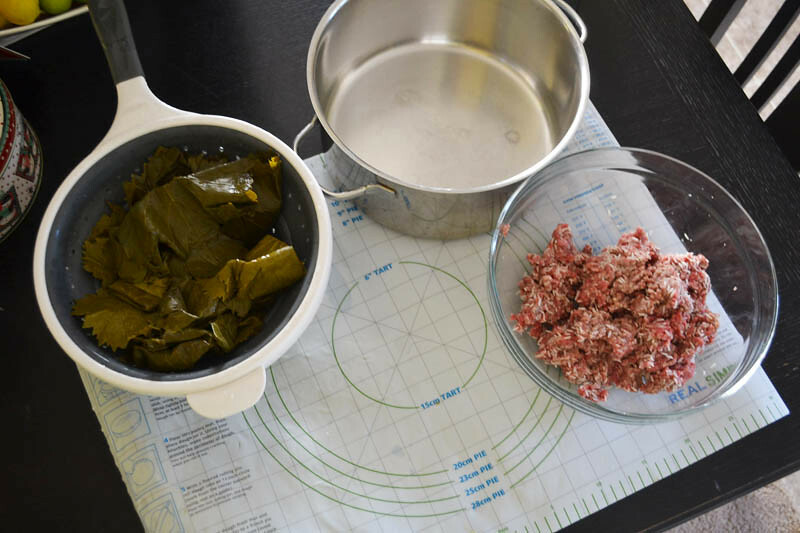 On a large work surface, set up an assembly line: Have a place to roll the leaf, the bowl with beef mixture and a large pot to place rolled leaves in. On a flat, clean surface spread the leaf flat. There are 2 sides of the leaf. A "shiny" side and a "dull" side. Have the dull side facing you and the shine side down. Remove the stem with a small knife. Place a small teaspoon size of meat mixture onto the bottom of the leaf. Roll up half way and then tuck the sides in. Continue to roll until sealed. Place stuffed leaves, seam side down, on the bottom of the pot. *Place lemon slices in between layers of stuffed leaves. When all the leaves are stuffed, pour 1-2 cup of water in slowly and 2-3 Tb of butter. Any torn leaves cam be placed on top to help steam. Cook on low-medium for about 1 hour, until the leaves are tender and meat is cooked. These are beautiful! I always order stuffed grape leaves out. I’ve picked up a jar of leaves to make at home but have never known what to do with them! I grew up eating these as well. My family is from Lebanon. We pick wild grape leaves. Also add diced tomatoes. Love them. Hi Karen! I never thought of trying them with diced tomatoes? That sounds wonderful! Thank you! Made my first batch today…loved your mom’s simple recipe. Next time I will use minute rice instead of basamati. I also used my handy dandy grape leaf roller for the first time. It was so easy. Thanks a million. Hi Carolyn! So happy you made them! 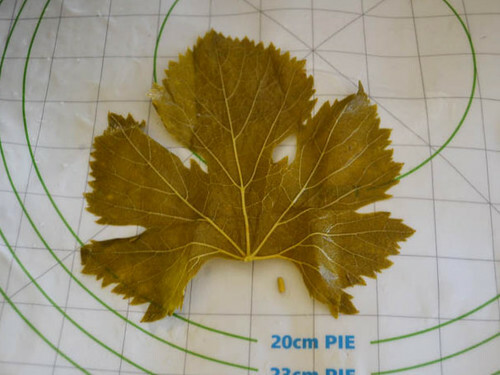 It is certainly a labor of love…now, more about this grape leaf roller?? Never knew that existed! Mom’s Grape Leaves Recipe is amazing! love this recipe. thank you so much for sharing it. Please keep share more recipe. So you don’t need to cook the rice prior to mixing? Hi Kerry! That is correct…uncooked rice mixed with uncooked meat. It will all cook as it steams low and slow!